False ceilings are often known as drop ceilings as they are literally dropped or hung from the main ceiling. The drop ceiling or false ceiling is more trendy these days. You can often see the different false ceiling types in your homes, offices, shopping complexes, restaurants, theatres, etc. These are generally the second ceiling hanged below the main structural ceiling! The area above the drop ceiling or false ceiling is called the plenum space, as it is sometimes used for HVAC air return. This space is commonly used to connect piping, wiring & the duct in homes, offices & at other places. Basically, the drop ceiling helps to cool the room when the height of the room or hall is too much. By using false ceiling you can also reduce the height. It also helps in reducing the capacity of the air-conditioner. Covering the upper area also have the multiple advantages such as getting space for air-conditioner ducts, concealed wiring, fixing light frames, security cameras, fire sprinklers & other fixtures. It also gives beautiful texture to the ceiling & provides the base for all kind of decorative electric lights & fans. The false or drop ceiling is a good illustration of contemporary architecture & construction in both residential & commercial applications! False ceiling types can be differentiated in several ways according to their types, applications, material utilized & appearance and visibility. Plaster of Paris (POP) is the most common & majorly used among all false ceiling types! The gypsum, which gives out the water when heated, makes the POP. Post-heating, gypsum softens & is then crushed to form the powder. POP hardens instantly when water is added to it. Plaster of Paris drop ceiling looks attractive & has a very long lifespan. They are extremely excellent insulators to heat & cold. This kind of drop ceiling or false ceiling not only hide the hideous members of construction, ventilation ducts, & conduits but additionally give a smooth finish to your ceiling! It gives a smooth, uniform finish & mouldable in any shape as per design! The surface can be painted depend on your interior! This false ceiling type is easy to construct & maintain. The most important feature of this false ceiling’s beauty is an indirect form of artificial light. The process of mixing the content of POP on site is a messy & elongated procedure that requires a lot of cleaning! A lot of POP mixture is wasted in the application process. The pop false ceiling has comparatively higher risk of cracking. The wood ceiling is utilised owing to its natural textures & design. Nowadays the wooden false ceiling is used very commonly & have a very pleasant impact on the viewer’s eyes! However Wooden false ceiling is costly, so least utilised for malls, hospitals, etc, but may be installed in residential buildings! The wood ceiling is sometimes given different finishes for the attractive look! Hollow wooden blocks or wooden panels, or wooden boards or sometimes plywood can be used to make the wood ceiling. Wooden blocks can be easily installed even with the help of nails and screws. The wood ceiling is generally used for cold climates. They are strong but difficult to maintain since they are prone to termite attacks! Also, the wood is likely to warping & other physical changes with time! They are strong & look attractive. They can be given the various finishes, or painted to get the right look! They can be treated to increase their lifespan! Wood ceiling are difficult to maintain, since they are prone to termite attacks. The room has to be thermally controlled to reduce the humidity in the air! Wood is also prone to warping & other physical changes, with time! Gypsum board ceilings are tough, versatile & economical. It is a sterile sulphate of calcium, light weighted & easy to install. Gypsum ceiling tiles are fire-resistant, as well as soundproof; therefore it is most preferred material for false or drop ceiling! Gypsum ceiling tiles stem in the form of square planks which are wrapped with the support of the iron frame. Generally, 600mm×600mm gypsum ceiling tiles are used. The finishing can be done on those boards with paints, laminates, or wallpapers tofurther give the great appearance to your interior! Gypsum board is quite flexible. It allows various shapes & design such as plain, stepped, curved, coffered, pelmet, drop design, etc. Glass fibre-reinforced gypsum board makes excellent insulation material. When exposed to fire, gypsum gives out water, which is converted to steam & helps to combat the fire. This is what makes the ceiling fireproof! It cannot be used in damp situations. Finding a place to recycle it can be difficult, most end up in land-fill. Metal is a very durable material with a shiny surface! The reflection & its shine adds beauty to your interior. Metal ceiling tiles or sheets of different sizes & thickness are available for the purpose of Internal false ceiling! The most common metals used for drop ceiling are the galvanized iron & aluminum. 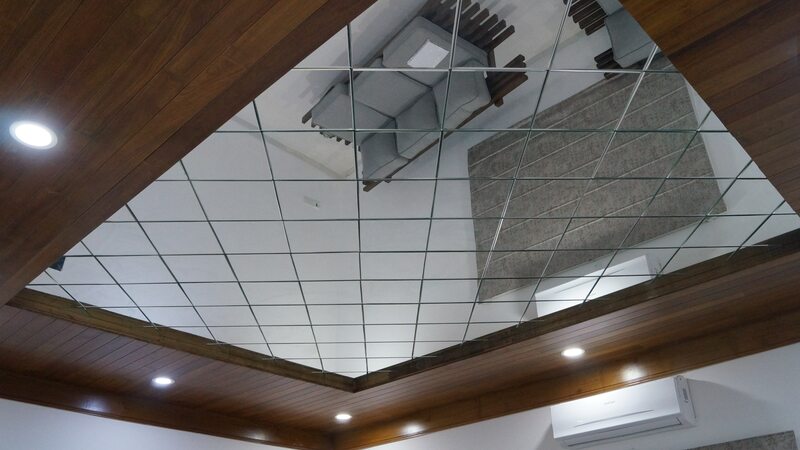 The metal ceiling tiles or panels can be laid on a visible steel grid with T-sections or cross-sections that are suspended from the ceiling by rods. The cost of this ceiling are low as they are easy to install and access & also consumes very less labour. The hidden members of the structure are easily accessed as the metal ceiling tiles or panels are easily removable & reattached. Fixing and installation of the metal sheets is quite easy and consumes very less labor. Therefore the construction cost becomes less as the installation, fixing & maintaince is low! Fire resistance is a huge advantage for people who are concerned about safety! They do not crack or warp with time & retain their shape. Peeling is unheard, which means that you will have a ceiling that requires almost zero maintenance & repair. Metal tiles do not have many cons, except for the cost of genuine metal materials. The investment can be sizeable plus the cost of a protective coating to prevent corrosion over time! PVC ceilings are lightweight, moisture resistant; that reduces the condensation & subsequent dripping from the ceiling to the work surfaces! PVC Ceiling tiles are easy to clean & are UV stable! Therefore it will never get discoloured! PVC ceiling tiles usually solve the problem of dirty & unhygienic ceilings that are difficult & expensive to clean by providing a bright, durable & hygienic surface, which is effortlessly maintained! They are waterproof, termite-proof, economical, maintenance free. Also being non-porous & non-absorbent, they can incorporate flush fitting, lighting, access hatches, air vents & sprinklers. They are easy to install & available in various colours & there are no hassles in painting or polishing! 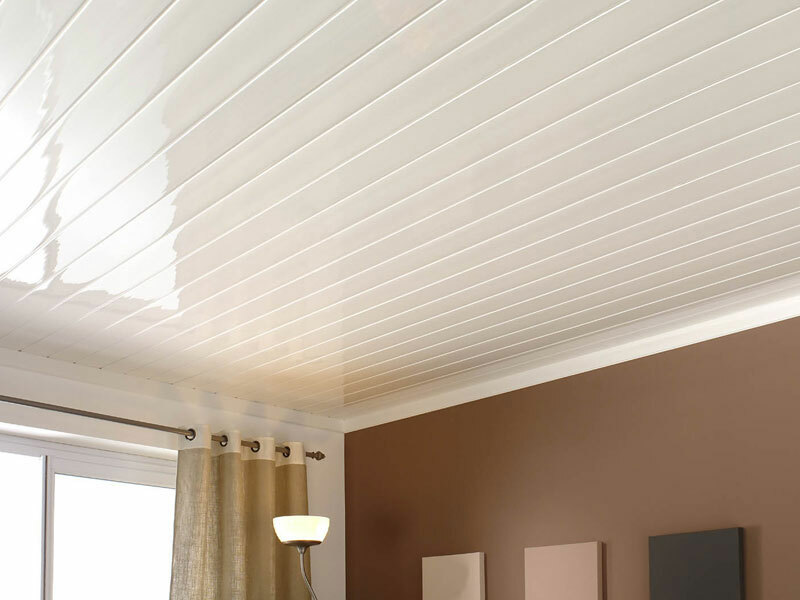 PVC ceilings are inexpensive to make & install. They are mass produced, means they are available through a wide variety of different distributors & in nearly every colour possible! PVC ceilings are durable & sturdy. They will last for a very long time & require very little maintenance! One of the biggest urging against PVC as a material is that it makes use of chlorine, which is a dangerous & toxic gas in its natural state! PVC is not the most attractive type of ceiling covering as compare to other false ceiling types! The fabric is an economical material; it may be draped across the ceilings, they are mostly used for temporary purposes in big churches, Yoga Rooms, Restaurants, function halls, etc. They are not highly recommended as it collects dusts! The light is diffused through the fabric providing a comfortable intensity. This kind of false ceiling is not as functional as other ceilings but greatly adds an aesthetics of the place! Very few ceiling coverings on the aesthetic qualities can come close to the high quality fabric! Cloth easier to smear the surface, it absorbs odours, & settles the dust! Mostly used for temporary basis! Mineral fiber ceiling tiles is a material developed by natural or synthetic minerals. Mineral tiles are ceramics, reinforced with natural stone, wood, vegetable fiber, bitumen & tars. This process increases the insulation capacity of the product! Therefore they are perfect for heat & sound insulation! These mineral fiber ceiling tiles are available in various sizes, shapes & patterns. They are economical & quick in installation! They have high insulation against sound & fire. The fiber increases the hardness & toughness of the material. Cannot be use for residential areas, not that much decorative or appealing for home interior! Glass is a non-crystalline material, brittle but transparent. But this can be altered to make it non-brittle & non-transparent by using some admixtures! A glass is a good heat insulator. Because of its tranperancy it can make the space look bigger! Therefore it can be used for false ceilings in restaurants, libraries, etc. Glass false ceiling looks great on ceilings & aesthetically they appear remarkable! It allows the eye to travel & explore the space without obstruction. And of course, glass can be coloured, patterned or laminated & provide an interesting focal point to your room ceiling! Obviously the most common issue with glass is the lack of privacy it provides. False ceiling besides imparting an aesthetic appeal is also very functional! Modern buildings, especially, malls, hospitals, & residential buildings have developed the concept of false ceiling because it hides all the ugly members of the real ceiling & its piping & cables & imparts a smooth finish & catchy surface for your interior! It is not mandatory that only one material can be used for making a false ceiling design. Two or more than two materials can also be used. For instance, the combination of wooden & POP is quite common! Things to Know About False Ceiling for Your Interior! Next PostNext Home Renovation: Important Things to Know!